The Rembrandt Card lets you White Balance the same way shooters for network TV shows do to get that pleasing warm look. 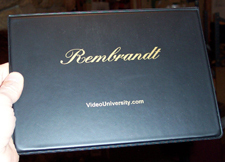 Now you can give your video interviews, landscapes and sunsets that same, warm Rembrandt look! You also get a complete DV shooting course on CD ROM. Professional video shooters have always liked to tweak their cameras a little with a white balance trick. Instead of using a white card, they use something that’s light blue like faded blue jeans. This gives the shot a pleasing “warm” look. The only problem is the results are a little unpredictable especially when the color blue changes. The Rembrandt Card solves that problem. You get a consistent color every time. And you’re not locked into one shade of blue. There’s an easy way to change it to suit your tastes. You get a 17- page article with lots of color pictures demonstrating how you can control color with our Rembrandt card, and many other shooting tricks and tips to put you in creative control of the look of your video. 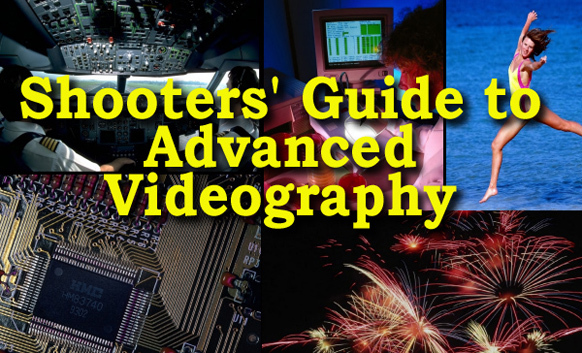 You’ll learn about color temperatures, how to create your own white balance cards and many special shooting circumstances like shooting monitors and TVs, tricks of shooting under fluorescents with examples and a lot more. You get a complete course in advanced videography on CDROM. Here are some of the highlights of the first section entitled Master the Basics of Shooting. In this section you learn about camera platforms, camera moves, the three C’s of shooting: Composition, Coverage and Continuity. 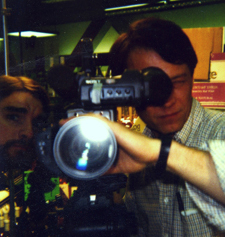 Then learn about insert shots, cutaways, the 180 degree rule, eye direction, screen direction, how to use the basic four lights, basic sound recording and more. A good rule for hand-holding the camera. A shooter’s trick for getting rock-steady hand held shots every time. And much more! This is the stuff you need to know. More than any other, lighting is the one skill that separates pros from amateurs. For many shooters lighting is the most creative aspect of shooting. Creative lighting can turn an ordinary, boring shot into a grand visual. Here’s what you’ll learn: Choosing & Using Lighting Equipment, Tips for the New Pro, Extensive Excerpts from two Video Lighting books. Learn about Chimera Lighting and the special Fluorescents and more. By understanding and controlling your lens you can create even more beautiful and interesting shots. Learn how to control depth of field to radically change any shot. Learn how to avoid lens distortions and how to use them to your advantage. Learn the only right way to clean your lens and see how one $10 item will protect your $1000 piece of glass. See before and after shots where the only difference is one filter on the lens. You’ll get a complete course on filtering so with just one or two filters you start making much better looking video. You will see why feature films are never shot without filters. Let’s face it, zooms are overused and just magnify the image. A zoom shot can shout Amateur more than anything else. A Dolly Move, on the other hand, brings your audience right into the action and makes them feel like they;re watching a feature film. You get the complete plans for building the DP Compact Dolly. It will cost about $50 by folowing our plans (or you can buy one just like it from a major grip company for over $3000). But we think our DP Compact Dolly is better than the $3000 dolly. And you’ll see why. You’ll also learn all the tricks about how to make a great dolly shot. You even get video clips of dolly shots with narrated commentary so you’ll know how to do your own. Use a dolly shot just once or twice in a production in place of a zoom shot and see how it raises your production values to a brand new level of excellence. Fine Art and video may seem to have little in common, but fine art is where it all started. 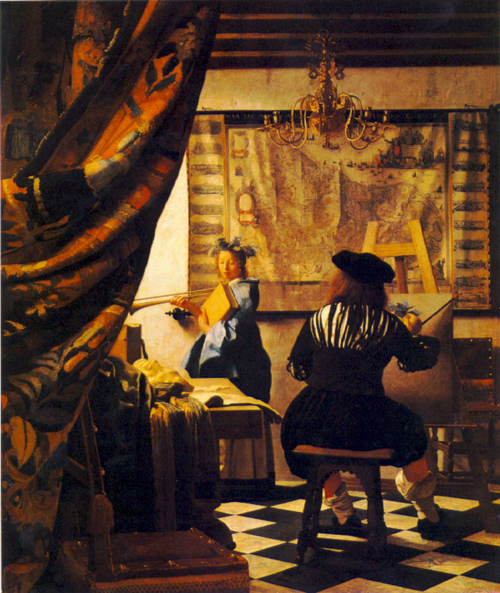 This article entitled Study Fine Art will ignite and fuel a passion for visual beauty. See the beautiful lighting in the Vermeers, Rembrandts, Monets and Renoirs you see in this article. If you study and think about just the light alone in those luscious paintings, you are on your way to making better video. We hope you will continue to study fine art on your own. We’ll also show you some great and free ways to study art on the internet. We hope this will also inspire you to visit art museums, take art classes, and become an art lover. What can a Videographer Learn from this Painting? Broadcast Requirements of typical TV stations. High Resolution Lens Focus Pattern Charts AND SO MUCH MORE! It’s over 140 pages of articles with lots of photographs and diagrams and video (for the dolly article). This product is guaranteed to help you make much better-looking video or we’ll give you your money back. It’s that simple.